On September 29, 2019, the Protect Wisconsin Waterways team helped the Beaver Dam Street Department clean leaves off the street. To ensure the fallen leaves do not end up in our waterways or clog our storm drains, the Beaver Dam Street Department requests that community members pile their leaves on the curb. 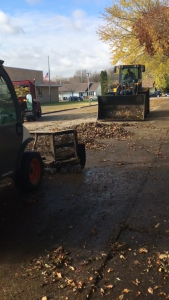 The Beaver Dam Street Department goes to the site with two Bobcats, a dump truck, and a street sweeper to clear the street of as many leaves as possible. 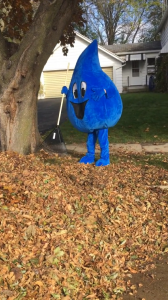 We helped the Street Department push leaves into the street and Splash made an appearance to help clean up leaves. Pictures and videos of our event were posted on social media. The focus of our video is to inform our audience on the harm leaves can have on our rivers, lakes, and streams.